Arrowheads & Native American Indian Artifact sales and services from pre-historic to historic periods. Michigan Arrowhead Indian Relic buyer. Located in Southern Michigan, ALL POINTS COVERED is owned and operated by Todd Walterspaugh. I am a member of several organizations that focus on the collecting and preservation of Prehistoric Native American Artifacts. I am also the current President of the Wolverine State Archaeological Society "Michigan" chapter of the Central States Archaeological Society. We proudly offer sales and services of AUTHENTIC Native American Artifacts dating from the Pre-Historic to the Historic periods. Whether you are new to the hobby or a seasoned collector, we have the inventory to meet your needs. If you don't happen to see what you are looking for, please CONTACT US and we will do our best to find it for you. We also maintain weekly Ebay auctions and often offer items there that were never in our store inventory. You can purchase with confidence from ALL POINTS COVERED! Artifact fraud is a serious problem! Together with other reputable dealers we are working hard to eliminate fraud. We highly recommend joining an organization that supports AUTHENTIC artifact collecting. You can find more information on these organizations by visiting my LINKS page. Welcome to All Points Covered.com! In addition to the stores Inventory, I am still on Ebay with additional items. 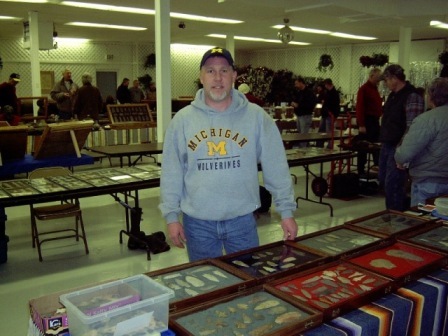 The Wolverine State Archaeological Society will be holding an Indian Artifact Show on June 7, 2014 at the Kalamazoo County Fairgrounds. Show details are listed below. Feel free to contact me with any questions. I hope to see you there!! Please visit our Blog by clicking on the image below.